于艳超, 王莉莉, 潘巧, 辛九庆, 王秀梅. 肠炎沙门菌luxS缺失株的构建及其生物学特性研究[J]. 畜牧兽医学报, 2018, 49(6): 1291-1298. YU Yan-chao, WANG Li-li, PAN Qiao, XIN Jiu-qing, WANG Xiu-mei. Construction and Biological Characteristics of Salmonella Enterica Serovar Enteritidis luxS Mutant[J]. Acta Veterinaria et Zootechnica Sinica, 2018, 49(6): 1291-1298. Abstract: The study was conducted to investigate the effect of LuxS/AI-2 quorum-sensing system on the biological characteristics of Salmonella enterica Serovar Enteritidis. A luxS mutant strain was constructed by Red homologous recombination system, and its ΔluxS gene stability, growth features, antimicrobial susceptibility, adherence and invasion, as well as biofilm formation were determined and compared with the wild type. 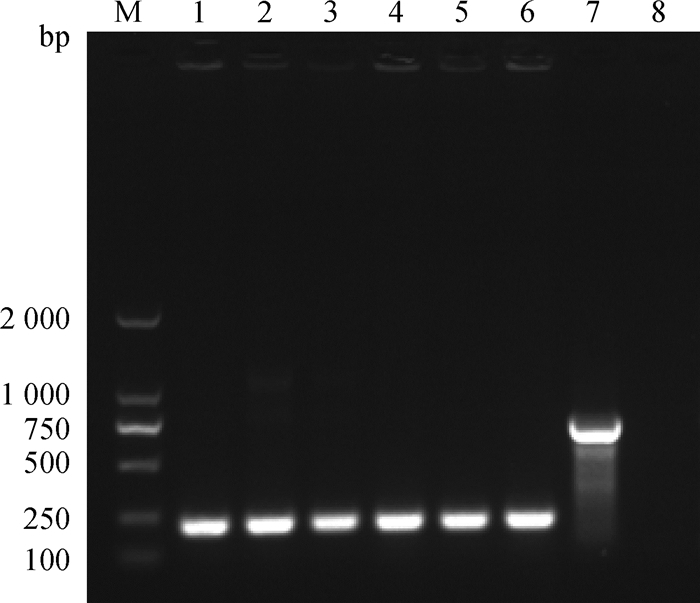 Our results showed that the ΔluxS gene exhibits stability in ΔluxS mutant. 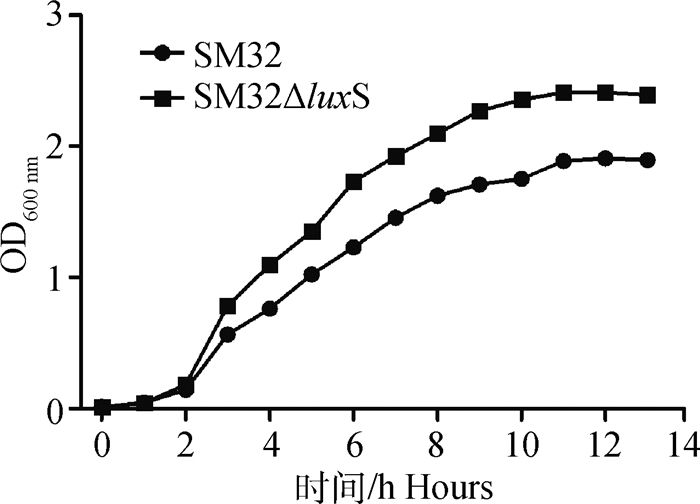 The growth of ΔluxS mutant was slightly faster than the wild strain in vitro. Biofilm formation of the mutant strain was significantly enhanced as well as the adhesion and invasion ability to DF-1 cells and Caco-2 cells. Deletion of luxS resulted in a 128-to 256-fold increase in susceptibility to fluoroquinolones and moderate increases (2-to 8-fold) in susceptibility to ampicillin, tetracycline, doxycycline, chloramphenicol, and florfenicol. These results suggest that LuxS/AI-2 system affects biological characteristics of SE including biofilm formation, adhesion and invasion to cells, moreover, the AI-2/LuxS sensing system affect antimicrobial susceptibility of SE through certain resistance mechanisms. 王嘉炜, 肖英平, 杨华, 等. 鸡肉源沙门氏菌血清型、药敏性及部分耐药基因研究[J]. 食品科学, 2017, 38(15): 140–146. 王亮, 张元鹏, 张荣武, 等. 鸡源性肠炎沙门氏菌的流行病学调查[J]. 中国人兽共患病学报, 2011, 27(5): 455–458. BASSLER B L. Cell-to-cell communication in bacteria:a chemical discourse[J]. Harvey Lect, 2004-2005, 100: 123–142. 司微, 于申业, 陈利苹, 等. 肠炎沙门氏菌tu-fA基因缺失株的构建及其生物学特性研究[J]. 中国预防兽医学报, 2015, 37(5): 361–365. Clinical and Laboratory Standards Institute. M100-S23 Performance standards for antimicrobial susceptibility testing; twenty-third informational supplement[S]. Wayne, PA: CLSI, 2013. KOSTAKIOTI M, HADJIFRANGISKOU M, HULTGREN S J. Bacterial biofilms:development, dispersal, and therapeutic strategies in the dawn of the postantibiotic era[J]. Cold Spring Harb Perspect Med, 2013, 3(4): a010306.